OmegaFlex FC075-MM12 3/4“ NPT Stainless Steel Flexible Connector is used for connecting piping to pumps and dispensers and throughout the piping systems where connections and changes of direction are necessary. OmegaFlex FC10-MM24 1“ NPT Stainless Steel Flexible Connector is used for connecting piping to pumps and dispensers and throughout the piping systems where connections and changes of direction are necessary. OmegaFlex FC15-MM12 1.5“ NPT Stainless Steel Flexible Connector is used for connecting piping to pumps and dispensers and throughout the piping systems where connections and changes of direction are necessary. 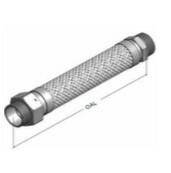 OmegaFlex FC20-MM12 2“ NPT Stainless Steel Flexible Connector is used for connecting piping to pumps and dispensers and throughout the piping systems where connections and changes of direction are necessary. OmegaFlex FC20-MM24 2“ NPT Stainless Steel Flexible Connector is used for connecting piping to pumps and dispensers and throughout the piping systems where connections and changes of direction are necessary.